Robert Mondavi = Napa Valley. Robert Mondavi = Cabernet Sauvignon. Robert Mondavi = California wine icon. Now if we were playing a word association game all of those responses would be good ones if you mentioned the name of legendary winemaker and wine ambassador, Robert Mondavi. 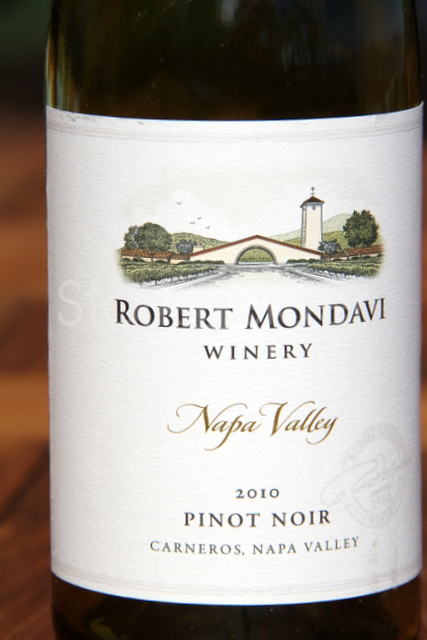 But what if we offered this one – Robert Mondavi = Pinot Noir. Huh? Pinot? Who? What? Why? Pinot Noir? Mondavi? So when I received a 2010 Mondavi Pinot Noir sample I wasn’t skeptical, I just didn’t really know what to expect. Fair or not, not many people associate the great Mondavi name with Pinot. When we think of Pinot we think of the Sonoma Coast and the Russian River Valley. Now, it’s also fair to say the Carneros region in Napa Valley was cool long before Pinot was cool when it comes to Pinot Noir. Okay, it has 7 percent Russian River Valley fruit to complement the Carneros but it’s very nice Pinot. The grapes hare hand picked, it sees about one-third new oak barrels, and the wine is still pretty young. I loved the really nice spicy, soft black fruit flavor. The wine was marvelously balanced and smooth. It had hints of a forest floor and a few fall pumpkin pie spices. It was beautiful wine. I’ve written before that we take the icons for granted. I tasted five or six $100-plus Mondavi Cabs earlier this year and was really impressed with the consistency and quality. This little $27 Pinot is a welcome brother to the winery’s better known bottles!